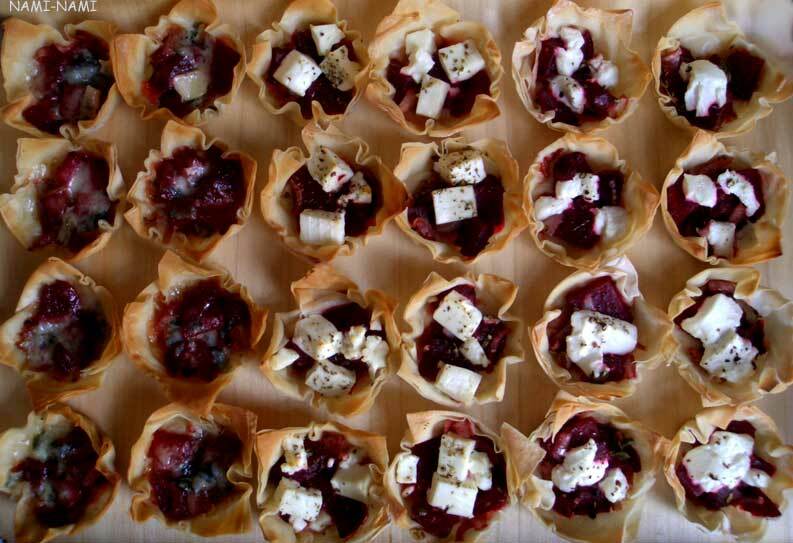 A recipe for elegant and surprisingly uncomplicated filo tartlets with beetroot and three different types of cheese. I know there are some foodbloggers who have declared their dislike of beetroot, but I really think this vegetable deserves a place on our tables. It is low in calories, high in minerals (Ca, Mg, Ph, K) and vitamins, it helps digestion, has anti-inflammatory and anti-bacterial properties and is generally good for you. And it tastes lovely. I've had several recipes on this blog using this vegetable - beetroot & goat's cheese sandwiches, beetroot & garlic salad, beetroot & feta salad. Hey - I even managed to incorporate beetroot into my Paper Chef pudding entry! I'm already looking forward to eating lots and lots of bortsch during the coming winter back home in Estonia. Back to the tartlets now. The filling of these beetroot tartlets are inspired by a recipe I spotted in the first book by a young Estonian model & food writer (there's a combo, eh:), Anni Arro, called Salatid, pirukad, suupisted (or 'Salads, pies and nibbles'). Since making beetroot & goat's cheese sandwiches in February, I had been thinking of using the same ingredients again. Anni provided a lovely recipe for a puff pastry tart with beetroot & feta, where the beetroot had been marinated in balsamic vinegar. I used this idea for the filling of these dainty filo tartlets. I made 36 tartlets using three types of cheese - feta (as in Anni's recipe), goat cheese (as in my sandwich) and blue cheese. I liked the strongly-flavoured blue cheese tartlets most. And for canape queens - these would also work well when made in mini muffin tins. And yes, I'm no longer intimidated by filo dough. Thanks, K! Mix beetroot and onion, season with salt and pepper. Add thyme, olive oil and balsamic vinegar, mix lightly and put aside. Lightly oil a 12-hole muffin tray. Work with one filo sheet at a time, keeping the rest covered to keep them from drying. Working from the shorter end, brush 1/3 of the filo sheet with olive oil, then fold over, brush with olive oil again, and fold the last third over. You'll end up with three layers. Cut into 6 squares, press each three-layered square into a muffin pan hole. Do the same with the next filo sheet to fill the other six muffin holes. 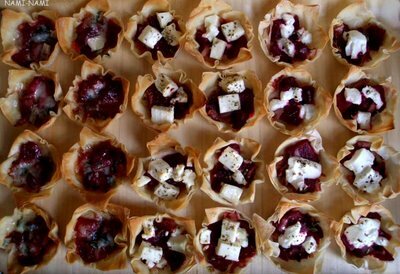 Now spoon a scant Tbsp or less of beetroot filling into each filo basket. Don't overfill them, as filo baskets are quite fragile! Dot a piece or two of cheese of your choice on top. (I sprinkled some dried oregano on the feta-filled tartlets). Bake at 200 C for 10-15 minutes, until the cheese has melted and filo is golden brown. Gently remove the tartlets from muffin tray and leave to cool on a metal rack. Repeat the process with the other 4 filo sheets, alternating the cheese, if you wish. PS These can be made a day in advance. Keep covered in the fridge, and heat gently in the oven just before serving. Thanks for this recipe! I love discovering new ways with beetroot and these look amazing! And tasty! Oh you are sooo good at little tarty things!! My husband and I were lucky enough to be offered some of those tartlets that you see in the picture. We can confirm that they are indeed delicious. Thank you, Pille! Hi Pille, I have seen similar filo tartlets in the fingerfood book (the one highly recommended by Johanna) which I bought lately and have put the basic recipe on my list. So I am delighted to see similar ones on your blog - and I love the beetroot-cheese filling. I can imagine very well that the blue cheese works perfectly with the sweetness of the beets. BTW, I hope so much that you will keep up your beautiful blog when being home in Estonia again, and I am looking forward to more recipes to come ! these tarts grabbed my attention! they look so scrumptious. And well done for getting over your fear of filo pastry. Pille, I love beetroot and these look fab! Bonnie - you're welcome! I'm still looking for new ways with beetroot, too. 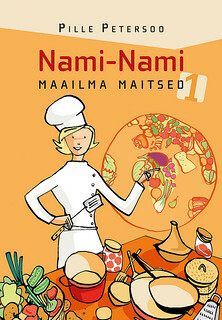 Mae - I'm crazy for halloumi at the moment (again:) - have grilled some almost daily for a week now! Aybike - I'm so glad that you and Bruce liked them. Plus, now your husband knows what beetroot looks like! Bea - whereas I'll form Carrot Appreciation Society with Alanna, Kalyn & Paz, then we two could start a sister chapter, Beetroot Appreciation Society? No? 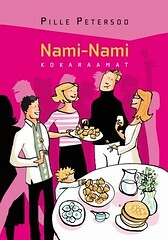 Angelika - thank you for the recommendation - I'll look up the book! Sounds like something I would like:) And of course I will keep my blog when I move back home!!! Jenjen - thank you! Re: filo pastry - once I saw someone working with it, I realised it's not too scary after all. Not sure why I was avoiding it like plague until now..
very nice. Thanks for this recipe! these look great!